Chewable Oraldophilus™ is the pleasant tasting tropical flavored probiotic. Probiotics are live organisms (which need to be abundant) in your intestines to support assimilation of nutrients and infection prevention. Chewable Oraldophilus™ has both of the most important probiotics that you need! Lactobacilius acidophilus (providing 1 billion culture forming units) and Bifidobacterium Bifidum (1 billion culture forming units) which can replenish and even enhance the correct quality and quantity of healthy bacteria lost. Let the Chewable Oraldophilus™ work for you! Chew one (1) to three (3) tablets daily, or as recommended by your healthcare practitioner. *** At the time of manufacture. Other Ingredients: Mannitol, maltodextrin, stearic acid, magnesium stearate, cranberry concentrate, Enzymax® (calcium carbonate, bromelain, papain, lipase, amylase, protease, silica), modified cornstarch, sucralose, natural berry and banana flavors, magnesium hydroxide, dextrose, propylene glycol, glycerin, sodium citrate, acacia gum. This product contains no animal products, wheat, yeast, gluten, soy, milk, salt, artificial flavors, colorings, or preservatives. Enzymax®, a vital digestive complex, is a registered trademark of Maxi Health Research® LLC. KiddieMax™ is a registered trademark of Maxi Health Research® LLC. One of my children had to take antibiotics and as a result was troubled with thrush, rashes, and itching. We tried Yummie Oraldophilus and the problem was solved! Thank you for providing great vitamins for our family. Recently my daughter had viral diarrhea for 2 weeks. 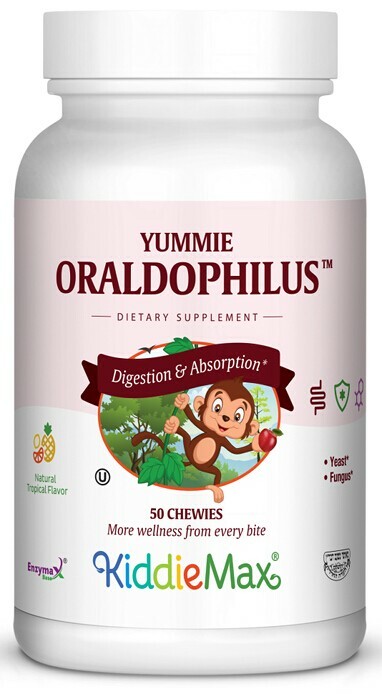 We purchased Yummie Oradophilus which tastes great and made the diarrhea disappear! My brother once had a major ear infection and the antibiotics weren't helping enough. My mother gave him Yummie Oraldophilus and he got much better, right a way!